what we say we will – our words and actions are aligned. To me Integrity at it’s most basic boiled down elemental form is - a promise. Saying you’re going to do something and doing it. It’s the nuts and bolts of what we do at Sterling and it drives every action, every interaction and every outcome. It’s the glue that bonds our core values together. When reflecting on what Integrity means to each of us perhaps we need look no further than the words echoed by our 35th President, “My fellow Americans: ask not what your country can do for you — ask what you can do for your country. When most people think of integrity, they think of being honest, doing the right thing even when someone isn’t watching, or always telling the truth. I agree that these are aspects of integrity but this word, to me, means so much more. A person who has integrity or demonstrates integrity is one who is definitely honest, does the right thing in every situation and tells the truth. Those are “givens”. But when someone says “that person has a high level of integrity”, it takes it a notch higher. This person is one who can always be counted on because they will do what they say they will do. They walk the walk and talk the talk. They are consistent with how they handle themselves and so everyone knows what to expect from this person. They stand by their commitments, they speak the truth even when it’s not popular, but do so in a way that is not spiteful. This person can be trusted, fully, without question. In many cases, it’s kind of like having a best friend on steroids which makes it a very special trait and is not always easy to find or to live out. 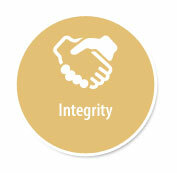 Integrity is one of the fundamental values that clients seek when they choose to work with Sterling. It is the assurance of sound moral and ethical principles. Integrity is the foundation on which relationships, trust, and effective bonds are formed. A person who has integrity lives his or her values in relationships with coworkers, customers, and stakeholders. Honesty and trust are central to integrity. People who demonstrate integrity draw others to them because they are trustworthy and dependable. You can count on them to behave in honorable ways even when no one is watching or even knows about their performance. When we have integrity, we gain the trust of our leaders, our colleagues and our clients. We are dependable, and when we hold ourselves accountable for our actions, we become role models for others to follow. This is turn, directly impacts Sterling’s success, as integrity is a characteristic of ethical leadership- clients want partners they can trust. Many of us have to make decisions that define who we are and what we believe in. Most often, the choices we face may seem insignificant. But this doesn’t mean that they are not important to us: even the smallest action can have an impact on our self-respect, our integrity, and ultimately, our reputation. The true definition of integrity seems to be different to different people based on their individual interpretation jean knock off from of this word. Some might feel that they are showing integrity if they are simply following the letter of the law. Others might feel that they are following it if they follow a certain religious practice. 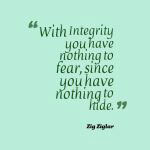 The fact is that integrity affects every aspect of our lives. It affects our work, our family, and every interaction of our lives. One definition that I like to adhere to is that “true integrity is measured by how we treat people who cannot benefit us in any way”. Another definition is making sure that whatever you do, you neither have to lie about it or hide it from another person. The fact is that we are all born with a moral compass. Every decision we make is either congruent with this moral compass or it is not. Deep down, we know whether or not we are demonstrating integrity. In closing, I have attached a saying from Zig Ziglar about integrity that I have always liked that sums up the definition of integrity well.